The traditional wood lathe is slow, the operator can not leave the machine, the operation requirements are high, the stability of the lathe is poor and complex. The operator need long time to learn, easy to make mistakes, high rate of defective products, processing speed is slow, processing quality is unstable, the surface roughness of the workpiece directly affects the next grinding process difficulty, but also makes the operation time. Labor intensity and difficulty are relatively large, when the part of the workpiece is hard, it is easy to break the workpiece and injure people, which is a safety problem that needs attention. STYLECNC fully automatic CNC wood lathe is not only suitable for processing slender wood, but also can process coarse wood, and has the characteristics of wide application range of soft and hardness of processing materials, the surface of the workpiece after processing is brighter than the existing wood lathe processing parts, including the base, bed, program control system, spindle box, center board, tool carrier moving system, tail. The seat and machine lubrication system is characterized by: program control system, spindle box, tailstock, knife holder moving system, machine lubrication system installed on the bed, the bed and the base connected as one, it is mainly used for wood processing. CNC wood lathe is not only able to process completely symmetrical wooden rod parts, they are also able to make highly difficult processing of heterosexual components, such as table legs, baseball bats, wood bowls, wood vases, special-shaped crafts and so on. It takes about 10 minutes for a table leg to be machined with a CNC wood router, and about 2 minutes for a fully automatic CNC wood lathe, which also includes rough grinding. Does this processing efficiency greatly improve the machining efficiency and quality of parts? Compared with the traditional lathe, the automation level of CNC woodworking machine tool has been greatly improved. CNC wood lathe does not require workers to operate the equipment at all times, but just before processing the drawings are programmed into the CNC lathe computer using a programming language, the computer will actively analyze, through the central processing unit to command the operation of the equipment. This kind of numerical control machine tool is a great relief for manpower and greatly improves the accuracy of delivery. Compared with the traditional CNC wood lathe, the CNC wood lathe is not only suitable for processing slender wood, but also can process coarse wood, and has the characteristics of wide range of application of soft and hard materials, the surface of the workpiece after processing is brighter than the traditional wood lathe. In traditional lathe, one product is processed intelligently at a time, while the two-axis two-tool CNC wood lathe in CNC wood lathe can process two same products at the same time. Simple operation, easy drawing, easy to understand, one-button conversion of product styles, no professional knowledge personnel can operate with a little training. And the fully automatic CNC wood lathe can operate 2-3 sets at the same time by one person, greatly improving the processing efficiency, saving labor and money, bringing good economic benefits. The time needed for parts processing includes two parts: the mobile time and the auxiliary time. NC lathe can effectively reduce these two parts of the time, so the processing productivity than the general wood lathe is much higher. The range of spindle speed and feed of NC lathe is larger than that of ordinary lathe. The most suitable cutting parameters can be selected for each process. At the same time, good structural stiffness also allows CNC wood lathe to carry out heavy cutting parameters, effectively saving the motor time. The acceleration and deceleration measures are adopted in the fast moving and positioning of moving parts of NC lathe, so the high speed of empty stroke is chosen, which consumes much less time in fast moving, fast retreating and positioning than the ordinary lathe. CNC wood lathe machining accuracy is relatively stable, generally only for the first part of the inspection and sampling inspection of key dimensions between processes, thus reducing the inspection time. In the use of CNC wood lathe with tool depot and automatic tool changing device, multi-process continuous processing is realized on one lathe, which reduces the turnaround time of semi-finished products and improves production efficiency more obviously. 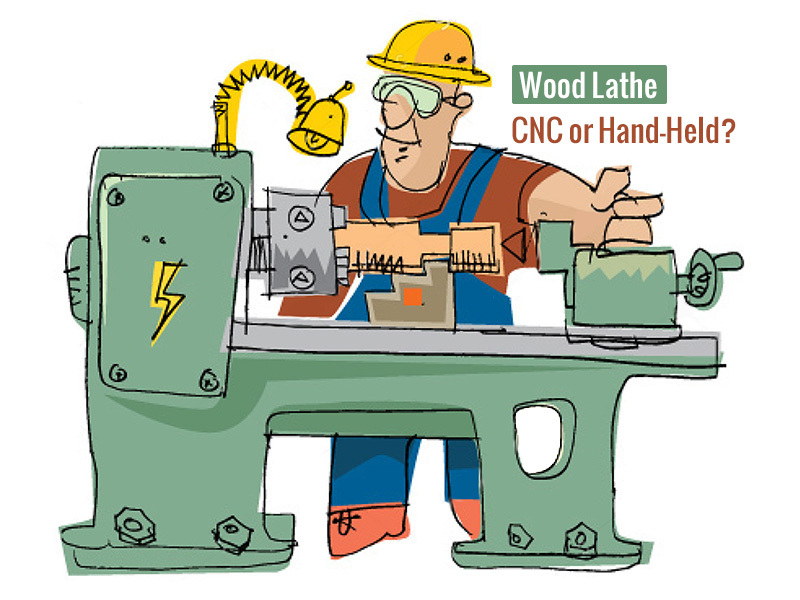 License: The text of "A comparison of CNC wood lathe and traditional wood lathe with hand-held tools" by STYLECNC is licensed under a Creative Commons Attribution 4.0 International License.